There was a point where all of a sudden I had nothing that fit. I procrastinated about sewing knits by concentrating on working that Marfy Jacket – which came to a screeching halt when I realised I’d cut, sewn and prepped TWO RIGHT SLEEVES. Time to procrastinate no more. 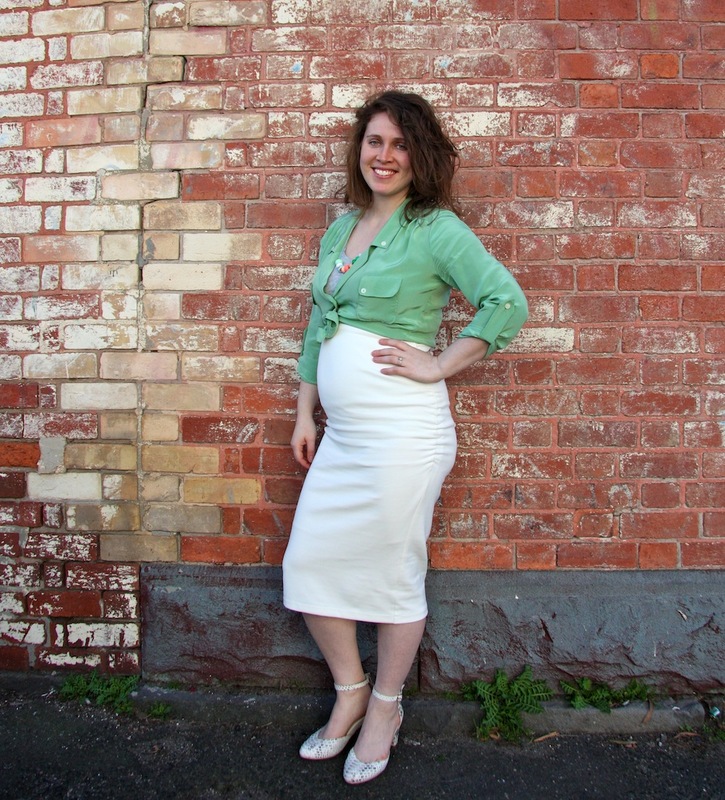 My first Megan Neilsen Ruched Maternity Skirt was from an off-white ponti knit fabric from The Fabric Store, labelled as a DKNY fabric. 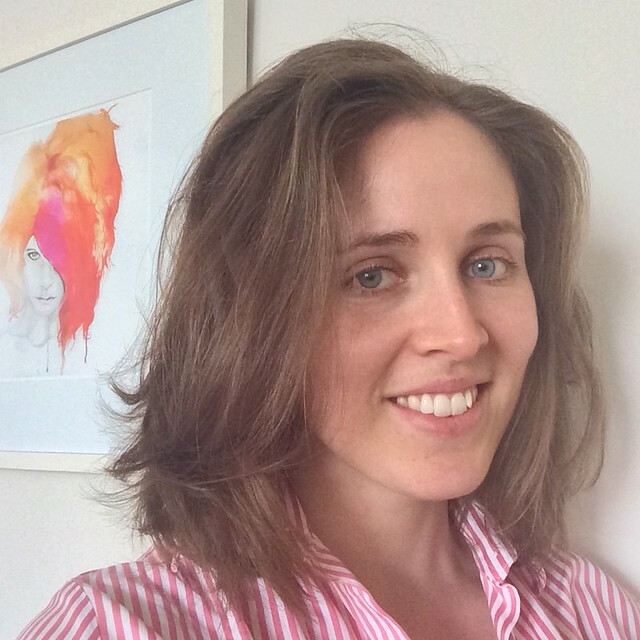 It’s lovely – soft, incredibly stretchy (50% by my calculation) with good recovery, and would provide a great base for my intended maternity wardrobe. Apart from being a little anxious about sewing with knits (you can’t exactly muslin it… where’s the control over how the fabric behaves?!?! ), I was wondering how it would fit/look. I knew I was onto a good thing when I sewed that Marfy Safari Blouse! I cut the Medium, which matched my pre-pregbot body measurements almost spot on. At the time of cutting this out, I was still the exact same hip measurement, but there was an additional 12cm where my waist used to be. Being so unused to knits – I was quite concerned about how the end result would fit. The PR review by Clio & Phineas is one of the more useful in this regard. She used a super super stretchy knit, and it was very close fitting. Being less further along in my pregnancy, and happy to have a well-fitting skirt in a thicker fabric that would at least see me through until it starts to get warm (not to mention I got the fabric at 50% off so I wasn’t too precious about it) – I took the risk of sticking with the Size M instead of sizing up. The skirt comes with 3 variations – knee length, midi length and with an optional ruffle (similar to the By Hand London Charlotte skirt). As for construction, well this is a pretty simple beast. For me to be able to say I cut AND sewed it up over the course of a day (in between life distractions) totally feels like an anomaly. Elastic? Drama. I bought three types – the only purveyors of such notions I know of are Spotlight and Lincraft, both of whose selections are incredibly lousy. One Lincraft I went to had rubber elastic – this turned out to be the best option and worked really quite well with the heavy ponte knit. (The other heavy-fabric suited elastic I bought didn’t have enough stretch in it). I’ll be going back for many more meters of this. 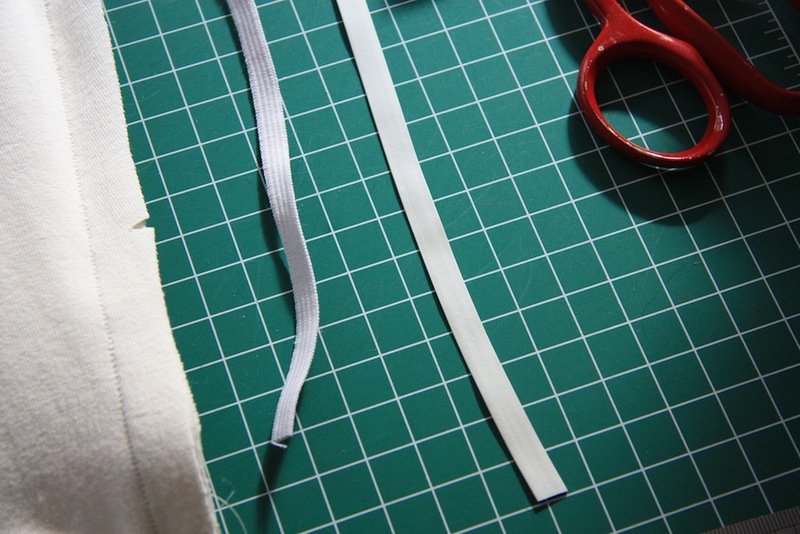 I found it easier to cut the length longer than specified in the instructions, then mark within that the length required – giving you space to hold the elastic taught between the notches on the skirt- you get a more even tension that way. Then just cut off the ends afterwards. Heavier duty elastic for thicker fabrics, lightweight elastic for thinner fabrics. Instead of making casing like the instruction said, I sewed the elastic down to the inside, then turned it down and used a twin needle and wooly nylon to finish it off. So I cut the midi length to see where it would sit on me once ruched – about 2/3 down my calf. I played around with lengths, and eventually decided on one that is quite long – below my knees and almost exactly halfway between the knee and midi length on the pattern. 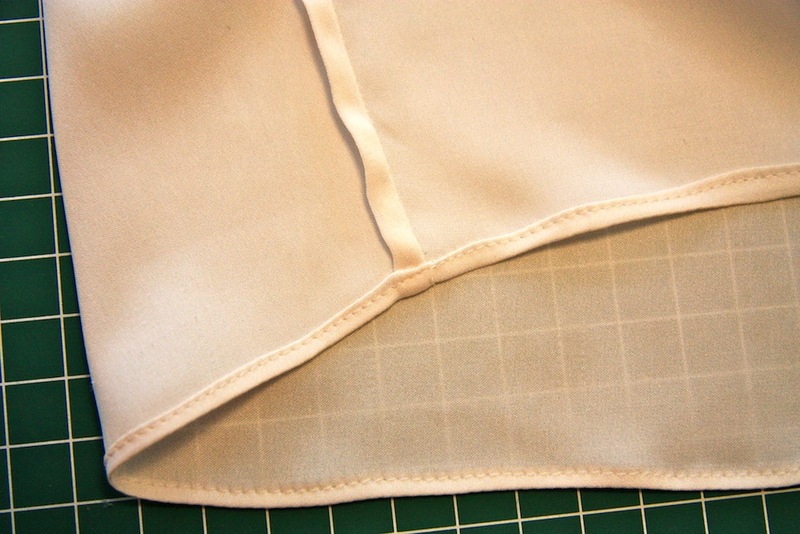 In future I’ll probably cut at midi length, then adjust because I suspect fabric type (namely, how well it ruches!) will affect this. Hem of the ponte knit skirt on the left, hem of the stretch silk charmuese slip on the right. I left an inch for the hem, then used a twin needle (with wooly nylon in the bobbin) to finish it off. Even though this was a substantial ponte – it was still slightly see through. My memory alerted me to the fact that aaaaages ago, I bought a 0.7m length of stretch silk charmuese (from D’Italia). So I made a short slip from the same pattern pieces as well. Bingo! Frenched side seams and a miniature hem at the bottom – makes me feel slightly less lousy about the nasty finishing on the ponte version! Except that this slip will probably only last me for a week – the stretch charmuese only has about 10% stretch, so even though I cut the Large for it, I will most likely outgrow it in a fortnight, if not before. It will still work really well for use under skirts when I’m not pregnant, so not a total loss – but I will need to find an alternative if I want to keep wearing the ponte skirt (which I do). Verdict? I really like this pattern. It came together in a timeframe I never dreamed possible to finish a garment in (is this why everyone sews with knits??). The only thing that irks my about my handiwork is the lack of nice finishing on the inside, the only thing that irks me about the pattern is that the side seams don’t match at the top. The Medium works well for now in this fabric – lets see how the 50% stretch works out over the duration of this pregnancy, because I can see that I’ll be wearing this A LOT. A Sunday afternoon sewing win. 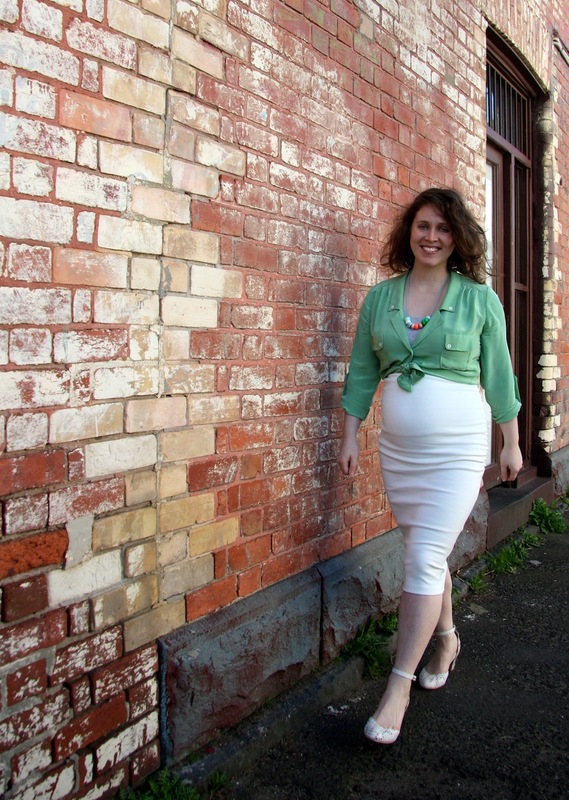 This is a great maternity skirt and looks fabulous on you. I know it is almost 30 years ago when I was last wearing pregga’s clothes which I did make for myself. 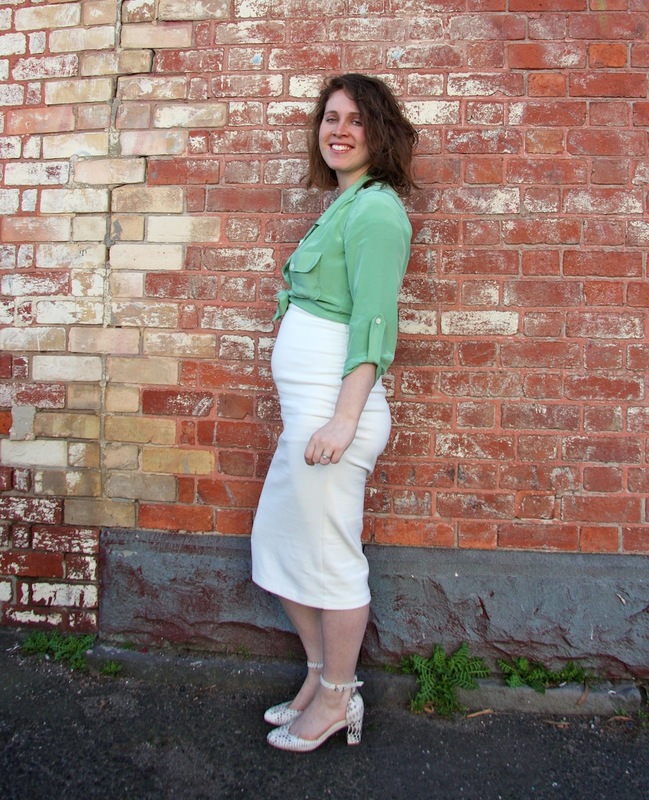 Back then I used Burda magazine maternity patterns and in the list of notions that you needed for a skirt or pants was an elastic with buttonholes every 5cm or so. 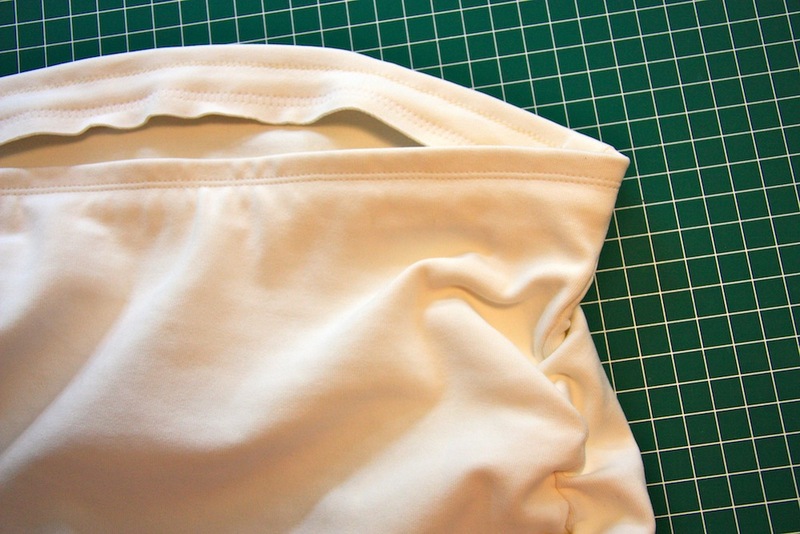 On the skirt or pants, you made a casing for the elastic to thread through. You need to cut a length longer than you are at the time to accommodate for growth. 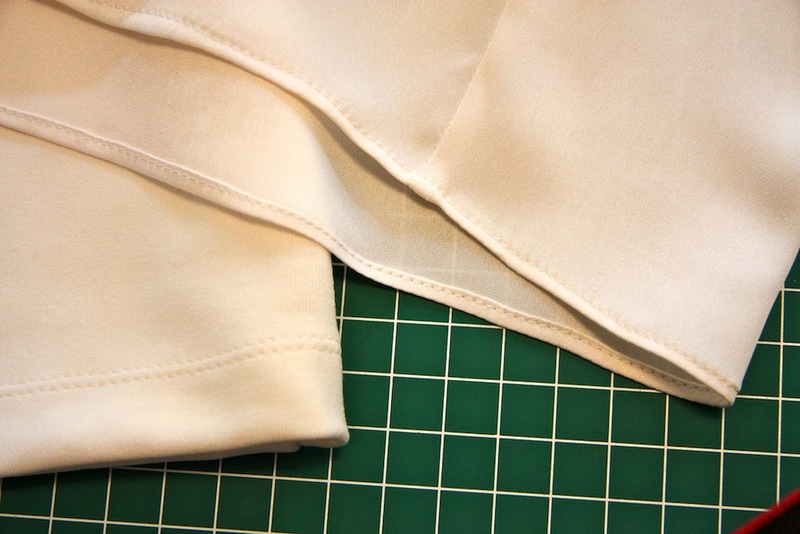 At one end you fixed the elastic with several rows of stitching and at the other end you sewed a button to fit into the elastic’s buttonholes. As your belly grew, you feed in some more elastic. I was living in Townsville then and you wouldn’t be finding elastic like that anywhere. So I made my own by making buttonholes every 5cm and it worked really well. My son weighed 11lb8oz, at full term and my belly was huge!! By the way Melanie, you are looking so healthy and radiant. Thanks so much, Majorie! Aren’t we lucky and spoilt these days to have the internet to order things from, I can’t imagine what it must have been like when all you really had access to was what the shops in your town supplied. Thank goodness for sewing magazines in the mail :) Nice problem solving work on the buttonholes – and oh my goodness what a chubba bubba! It looks fabulous, and no one needs to know about the finish on the inside (I think making a decent finish on a knit garment is one of the arguments for using an overlocker…) And yes, this is why I sew knits – so fast to whip up something, and the fit is so forgiving. Are you a convert, do you think – or maybe just for maternity wear? You’ll manage that, easy! The ponte is divine… and so lovely to wear. Good luck! haha, I just pre-washed some fabric for another one this afternoon! They so up so easily and quickly, and are so lovely to wear – how could I not? Thanks Vicki! knits and baby-bumps are a necessary combination! Love the white, such a versatile colour!! Knits are such a quick fix sewing project, I tend to do a couple of knit things in between my bigger projects :-) Your skirt looks fabulous, and I love that Marfy shirt as well. You are glowing! 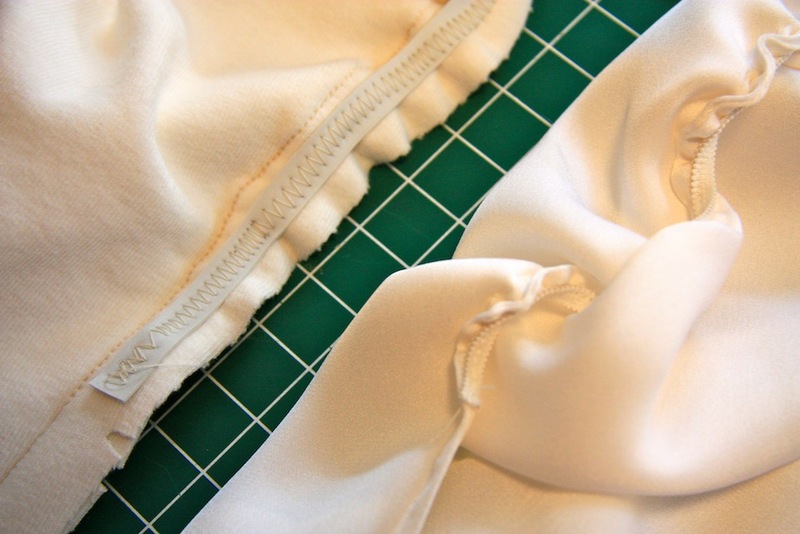 There is something unsettling about reading “A Sunday afternoon sewing win” on your blog, Mel ;) May I say you are rocking pregbot style like a boss with this? :D Side note: is Operation Marfy Jacket still on the boiler? It’s still in the naughty corner. Now I’ve finished this skirt I’ll probably go back to the jacket next weekend… if it’s lucky!!! And you’re telling me – I’m still wierded out about the whole-garment-started-and-finished in a few hours thing. It’s unnatural, I tells ya. Cheers, Boss! Great idea about the lining and using a different technique for elastic is super. You look way more stylish than me and my friends looked back in 1970 when all maternity fashions were huge to hide everything. You look absolutely beautiful!! 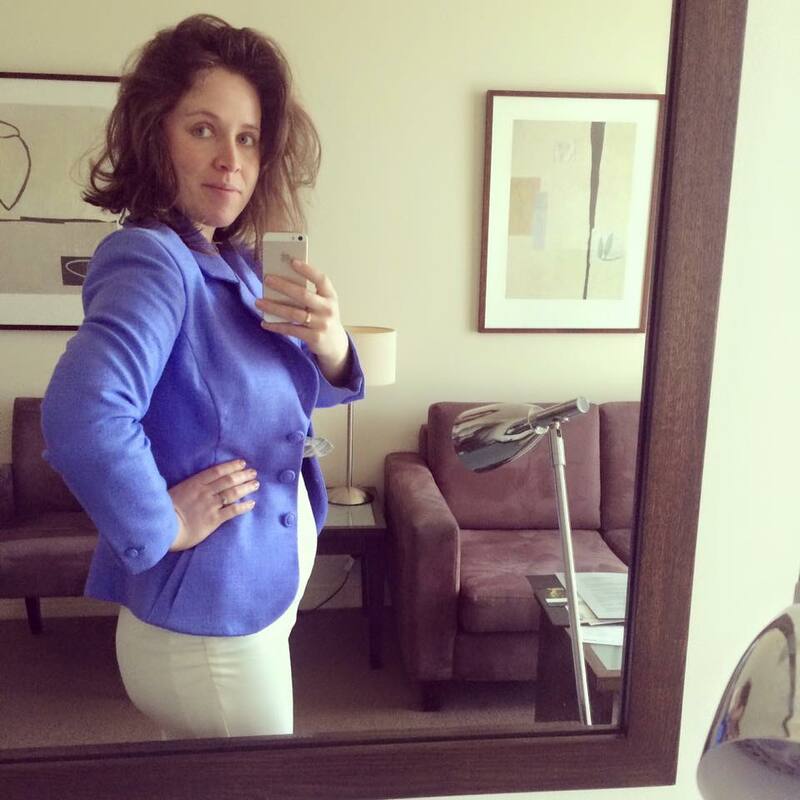 You’ve got such fabulous pregnancy hair going on, too. I made a few maternity things when preggo and knit skirts really are the best. Love this in white. You look amazing! What a fabulous skirt. And yup, that’s why we love to sew knits! So forgiving and a great wearable garment with minimal construction time! It’s been 12 years since I was last needing maternity clothes, and I sewed a complete wardrobe using Vogue’s old Lauren Sara collections. 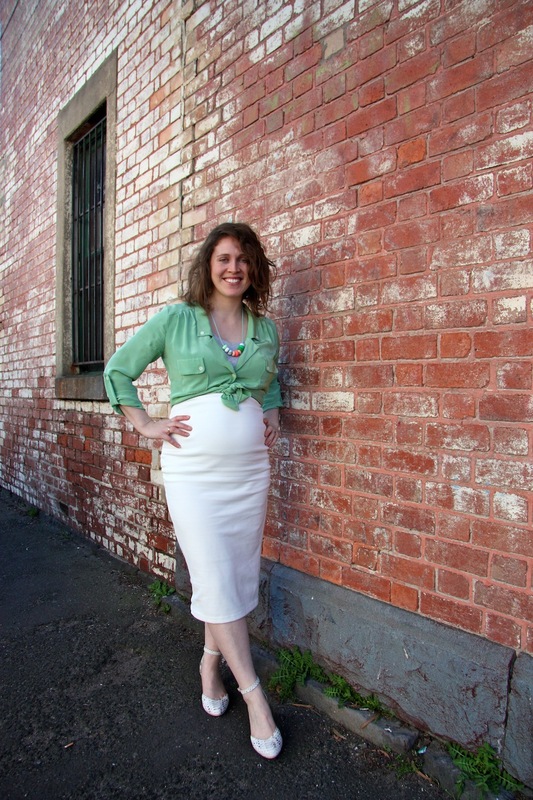 You look absolutely adorable and chic in your maternity skirt! Maternity clothes were just dreadful when I had to wear them. I love the new look and mothers who aren’t trying to hide their bumps. And wasn’t that Marfy shirt the one you thought was a goner? Yep we’re super lucky these days – I find it rather sad that for so long women have been expected to cover up with big baggy clothing – such a shame when it really is a beautiful thing to see. It was the other Marfy shirt that died in the hole – the one with polka dots and a ruffle at the front. This one I didn’t make the same mistake (cutting in too close to the armscye seam) and I can see it’s absolutely going to be a workhorse this summer. Thanks Cissie! You are looking fantastic and the skirt will get a lot of wear. Re elastic – have you ever checked out M Recht? I’ve only used mailorder, because I think they’re only open M-F, but as they supply industry, they are usually happy to send samples (their iron-on interfacing selection is amazing). I like the balance in your outfit – lovely woven silk top with a fast knit skirt! Points to you for sneaking some silk charmeuse into what was supposed to be an easy knit project. Elastic is so weird – there are so many varieties, sizes, quality levels, and it can really make or break a project… I made my first non-bralette bra this weekend and used 4 different kinds! I’ll admit I did totally laugh out loud when I realised what my solution to the lack-of-opacity was… silk charmuese indeed! 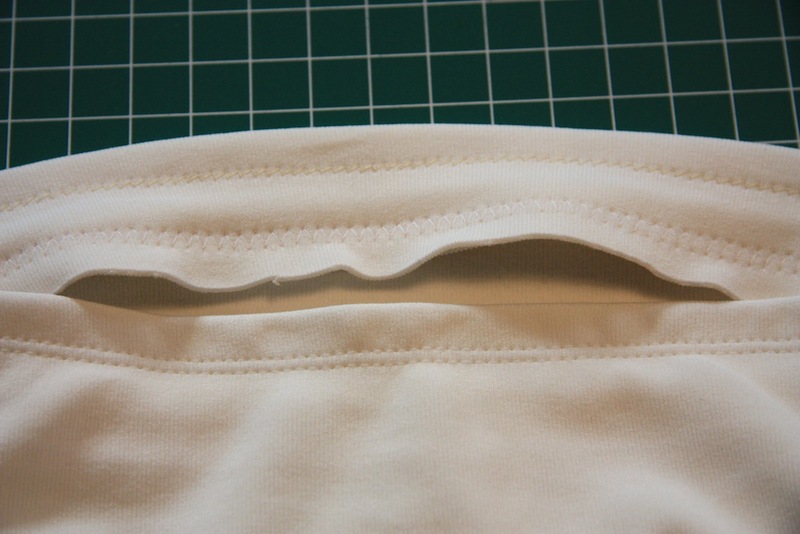 I think that’s the reason I’ve been putting off trying to sew underwear – the whole elastic thing seems so frustrating. I’m looking forward to reading about your experience with it though! I’d spent some time with fold-over elastic on So, Zo’s free undies pattern before this, and the interesting thing about it – and other sorts of elastics I’ve applied directly onto undies and bras/bralettes – is that it’s a feel thing more than a measurement thing, if that makes sense. Too loose and it’s wavy, too tight and everything is puckered and unpleasant to wear. I wished I saw this post when I was looking for maternity wear inspiration. Your whole outfit reminded me so much of Christina Aguilera’s Candyman video. And I can’t believe that you were able to cut AND sew the skirt all in a day! Amazing!